Central Asia consists of a great sweep of landmass running from the Pacific Ocean, off the coast of Siberia, to the plains of central Europe, with high mountain chains edged with tundra and desert. The foothills, plateaus, and valleys are often luxuriant, supporting villages and towns. In the vast deserts, rivers nurture the isolated oasis cities. The great cultural centers of Asia-India, China, and Iran-lie beyond the mountains. These cultural centers both influenced and were influenced by Central Asian tradition. At the center of this landmass are the Pamir Mountains. The Tien Shan range runs up through Tajikistan, Uzbekistan, Kyrgyzstan, and Xinjiang to circle the Tarim Basin (Tarim Pendi) and the Taklimakan Desert. Beyond, the Altai Mountains separate Mongolia from the steppes of Kazakhstan. Two major ethnic groups populated the area during prehistoric times. The people of Indo-European descent, who had an agrarian background, moved eastward and were responsible for the oasis settlements, while the nomadic Turkic tribes, belonging to a number of Mongoloid people, moved westward from the steppes. The fertile ravine and upland areas, running in an arc from Iran to China, have a network of autonomous kingdoms; the oasis cities of the Silk Road were linked by trade and religious beliefs. From the first century B.C.E. to the Arab conquests of the eighth century C.E. the main kingdoms, known as khanates, were Chorasmia, largely Turkmenistan, Bactria, northern Afghanistan, and Soghdia (in the area of Uzbekistan) lying between two main rivers Amu and Syr Darya. Fergana included Uzbekistan and Tajikistan and ran up to the Osh area of Kyrgyzstan, with the cities of Nisa, Merv, Samarkand, Piandjikent, and Bamyan. The vast open areas were home to a number of tribes whose way of life was nomadic. They moved over the vast steppe lands with their herds of sheep and camels, as well as their horses, which gave them the mobility to strike at powerful enemies and subdue them. The horse was in a way their lifeline, as they could travel long distances living on the mare's milk and the fermented kumis. The Greek historian Heroditus (484-425 B.C.E.) wrote about the tribes, describing their mobile homes (yurta) and the seasonal movement over vast areas. The description would still fit the way of life of some Kazaks, who inhabit the remote area of Noi in Uzbekistan, and the Torko-mans of remote parts of Turkmenistan and the extreme northern part of Iran. The nomadic way of life led to the development of a range of textiles for fabrics used for their homes as protection from the harsh elements, and also as woven, felted, and embroidered objects. These made up furniture, containers, habitat, clothing, objects that marked the rites of passage, and exchange that built social ties. The woven designs signified their identity; many motifs had an esoteric meaning, helping them to control the evil spirits that governed the unknown. The fleece of the sheep provided wool for felting, creating the yurta, caps, shoes, and coats. Wool was also spun, crocheted, knitted, and woven into fabrics. Excavations have revealed felted fibers indicating that this art was known from Neolithic times. The frozen Pazyryk burials (400 B.C.E.) of the Scythians have led to the discovery of extraordinary felts with complex patterns, woven carpets of great fineness, and embroidered silks, which reveal the sophistication of the culture of these people, who were termed "barbarians." Trade was carried out by the tribes from very early onward with the Chinese to the east, as well as with the Greeks to the west. The Silk Road may have existed from an earlier time, according to some scholars, than the historic date associated with Emperor Wu-ti (145-187 B.C.E.). The fact that Emperor Wu-ti negotiated with the King of Fergana for brood mares and stallions indicates that he wanted to play an important role in the exchange of commodities. The excavations at Loulan and Niya by Sir Auriel Stein revealed rich colored figured textiles, felt, carpets, tapestry weaves, and remnants of wool garments and other fibers for wrapping bodies for burial. 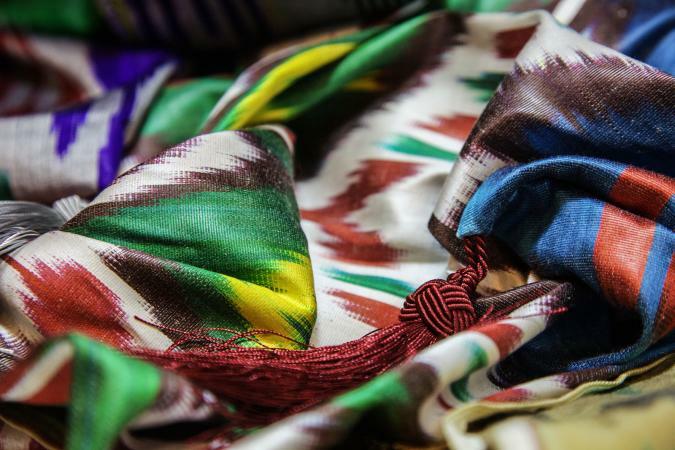 The rich tradition of textiles shared by the area indicates close links with China. The trade contacts also brought influences from India, as well as the near east. Pliny (41-45 C.E.) mentions trading with Central Asia since ancient times. Some of the finest historical textiles after the discovery of the Scythian burial sites are the Sogdian textiles woven from the seventh to the ninth centuries. The weft-faced complex twill woven in silk has patterns enclosed in roundels with juxtaposed animals and birds similar to the Scythian traditions. A common motif is paired ducks facing each other with a tree of life between them, and juxtaposed lions enclosed in circular beaded enclosures-a device very common among Sassanian textiles. However, the delineation of the hunt is powerful and shows a remarkable linear strength and mastery over the technique. 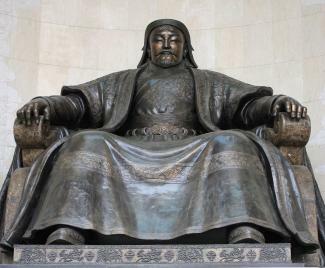 Under the Mongol leader Ghenghis Khan, a large number of Turko-Mongol tribes-the Sakas, Scythians, Sarmatians, and others-were united and controlled the entire area. Khan brought many masters of craft traditions, which enriched the Central Asian traditions and added to the cultural heritage. Upon Khan's death, Central Asia was divided amongst his sons. Uzbek Khan, (1312-1340) a descendant of Ghenghis Khan's son, ruled a large area, converted to Islam, and along with his followers became prominent in the area as their faith unified the people. At the end of fifteenth century, the Uzbek army conquered much of Central Asian territory, mixed with the settled population, and created a dominant group, enhancing the area, which is now known as Uzbekistan. The Timurid Empire, from the mid-fourteenth century to the end of the sixteenth century, was a period of abundant cultural development of the urban settlements of Central Asia. Emperor Timur Lang followed the precept of his ancestor Genghis Khan and brought many of the masters of arts and crafts to his capital, and Samarkand began to produce woven textiles, which could compare to the very best. 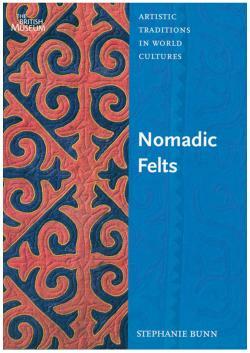 The nomadic tradition continued throughout the period, maintaining many of the woven techniques and woven patterns that reflected their identity and way of life. For instance, the hearth rug was central to the Torko-mans' yurta and had deep significance as well as distinctive patterns. The subjugation of the tribe would mean the introduction of the pattern of the dominant tribe in the hearth rug. Wool was the most important fabric used, not only by the nomadic people but also by the settled population. Their flocks provided them with material, with men shearing and the women cleaning, sorting, and carding for spinning. Men, women, and children all spun the wool as they moved with their animals. Amongst the nomadic people, the women used local plants as the base and minerals as mordants and generally did dyeing. In the large urban centers such as Bokhara, Samarkand, and Fergana expert dyers were known for their skills. Two different groups of dyers were known in Bokhara, those who worked with cold dyes and those who used hot dyes. The cold dyes were the domain of the Jews in the area, while the hot dyes were the specialty of Tajiks and Chalas, who dyed mostly silk or cotton. Dyeing was considered to have mystic qualities. Its practice was kept a secret even from the daughters of the household, and a number of ceremonies and taboos were related to the practice. Silk was obtained early from China, and there are Han records of 81 B.C.E. that talk of the importance of trade with the Hsiung-nu (tribal people) for large quantities of gold, which reduced their resources and weakened the enemy. Silk was the dress of the elite and is still referred to as padshahoki, the king's cloth. Only those allowed to wear silk by the local ruler could use it, or else they could face imprisonment and even death. Until the coming of the Soviet system of collectivization, sericulture was practiced as an individual activity in the rural areas or confined to small workshops in the towns. The process was quite primitive, and after the closure of the silk reeling factories in 1992, they returned to the old methods of processing. Cotton was grown in the oasis from ancient times, and the women processed the cotton, ginning it by using traditional wooden hand rollers (chirik). It was then separated, rolled, and made ready for spinning with the use of a spinning wheel (charakh). The weaving of plain cotton (carbos) was done by the weavers. Very fine-spun thread was woven along with silk to produce the mixed silk and cotton fabric known as adras for which the area was famous and which was also in demand for exporting. Gold thread and silk embroidery was sought after for the rich garments worn by the elite and for the production of khilats, royal robes of honor presented to distinguished guests or for esteemed members of their own clan. Bokhara was known for its expert gold embroiderers. The techniques can be divided into nomadic and urban, though the distinction cannot be rigid. Among the nomadic people the women for their own use did weaving, while in the urban centers it was the work of men, though in some cases there were looms in the home, which were used by the women. Felting was essentially a nomadic tradition and was carried out with pure wool. Two types of felts were created: the plain single natural color of the wool used for the making of apparel or for the yurta, and the patterned ones known as alakhiz. The patterns were integrated into the felt by laying the designs on a canvas with use of long slivers of loosely twisted dyed wool and then covering the pattern with finely carded single colored wool. The finest namads (Iranian artisan felt rugs) of inlay designs were made by the Torkomans and also by the Kyrghyz women, a tradition that was found in the Pazryz burial mounds. Sprinkling the fibers with water mixed with a soap solution and rolling them with the feet and hands would result in a thick felt. Shaped caps, coats, jackets, mittens, and shoes were also made and decorated with embroidery. Another popular form of patterned felt was the shirdak created by cutting dyed felt pieces and creating myriad patterns, which was a specialty of the Kyrgyzi. Weaving of plain and twill weave woolen cloth for apparel was common and similar to the type found in ancient burial sites. The fine woolen weaving was for creation of shawls, which were used by men and women, as well as fine cloth for the long gowns-abas-worn by the priests, as wool was considered pure. Very fine quality lengths were woven for the imame worn as turbans in earlier times. The shawls were woven with motifs on the border with silken dyed threads. The mastery of the woolen technique was in the weaving of flat weaves for rugs and for hangings. Non-continuous weft weaving was used for soamak weaves with intricate multicolored woven patterns. Another technique with noncontinuous weft was the method of inter-locking tapestry. Both of these techniques later evolved into highly specialized weaving traditions, the termeh, which is associated with the Persian shawl weaving, and kesi, an intricate form of silk tapestry with interlocking weave. Recent research has revealed examples of kesi, which appear to have all the characteristics of Soghdian textiles with a liveliness of the flow of the patterns and brilliant use of color. An interesting kesi of the thirteenth century in the Metropolitan Museum has floating leaves, buds, and flowers, with ducks swimming among them. It has the spontaneity of the Soghdian textile repertoire. The earliest kesi to be found is in Turfan, which dates to the sixth century C.E. Soghdian brocades of silk were used for creating apparel, as well as for funerary cloth. Woven in weft-faced compound twill, its technique is quite distinct from the Chinese style of silk patterned brocade. The settlement of Muslim weavers in Central Asia by Ghengis Khan, of which two settlements are mentioned in the records of the period, contributed greatly to the stylistic development of designs and techniques. Khan also brought weavers from China and settled them in Samarkand, leading to a blending of styles and technical skills. The greatest contribution is their expertise in weaving cloth of gold known as nasij. Another important silk technique was the warp ikat known as abr. While the word means cloud, it here refers to the ikat technique and khan atlas for the pure silk of very fine patterns often woven with seven colors. 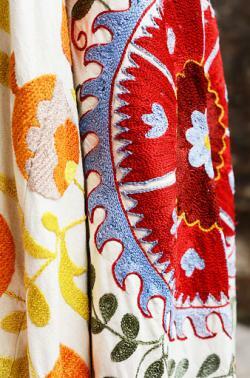 Bokhara, Samarkand, and Fergana were the centers for these very dramatic fabrics with rich colors and bold patterns. Research being carried out by the newly opened Department of Cultural History in Uzbekistan has located Sukhandarya as a place where ikat silk was also woven. Known locally as abrabandi, the technique is generally seen as having been introduced rather late, in the eighteenth century, but it is likely that this technique was used much earlier. The degummed washed silk warp threads were marked by the nishanzan or the designers, who chose a range of patterns derived from the diverse repertoire of patterns of Central Asia. They include ram's horns, tulips, pomegranates, kora-karga, black ravens, the badam, almonds, peacocks, cloud motifs, shonagul, comb design, as well as bold oi, the circular moon motif in blue and the red sun motifs combined with a stylized dragon. During the Soviet era, they created Ulag Oktyabr, October Revolution, and Kremlin patterns. The most prized and complex patterns in the ikat technique were the bakhmal, the ikat velvet, which was highly valued and was reserved for the royalty. The mixed cotton weft and silk warp-faced ikats known as adras were very popular as most households could wear these. Pure cotton striped ikat, yalong doveran, was also woven and was in great demand as only the royal household and those permitted by them were allowed to wear pure silk, while cotton could be worn by everyone. Often these were given to the kudunggars, the glossing workshop where the material was glazed with egg white and polished. A range of cotton fabrics was woven. Alacha and kalami were fine striped cotton. One of the most popular striped materials was known as mashku-zafar and was woven with black and saffron-yellow. Textured cottons woven with threads of different counts created a rich effect and were known as Salori bular. Central Asia has a tradition of printing on cotton and silk. It appears to have been practiced from ancient times, which is confirmed by the discovery of a fragment in an excavation carried out near Termez in Sukhandarya region of Uzbekistan. A fragment was also found in the fourteenth century C.E. grave of Bibi Kanum, wife of Tamerlane. The direct printing with the use of wooden blocks, qalib, was prepared in Bokhara, Samarkand, Fergana, Qorcom, Tashkent, as well as in Tajikistan bordering the Ferghan Valley. It is interesting that the word for printing is chint, which is also used in India. The printer is chintsar. Chintsaz is the word used in Isfahan, Iran, as well as in India. The carver of the blocks is known as kolkbhar. Some scholars are of the opinion that possibly printing came from India. Research in India has, however, revealed that chipa for the printer and chint for printed cloth are not Sanskrit words. The silk gauzelike cloth was printed with resist-printing near Bokhara in a town known as Chidgaron, which was known for its printing. Between 1840 and 1849, 2,500,000 printed cloth pieces of each were exported to Russia and Bokhara. Unfortunately the silk-resist printed scarves are no longer being produced. Silk embroidery known as suzan dozi was practiced throughout Central Asia. The style of embroidery, however, was quite distinct even within the same tribe. Uzbekistan has the richest variation, the suzani of Nouratta has great delicacy and is quite distinct from that of Bokhara, Samarkand, and Sukhandarya. Some settled people use satin stitch, while stem stitch is used for the more delicate motifs. Chain stitch with the use of the needle or the awl is used specially for bolder work and that prepared on leather, suede, or felt. Basma is a form of couching used for either gold embroidery or for bolder work covering large areas, as for the suzanis used as tent hangings. One of the most interesting embroideries is the Lakai embroidery, which often uses wool for the embroidery and has a bold primitive appearance and asymmetrical motifs. The embroidery of the Torkomans is very bold and done on silk with silken threads. Gold embroidery often worked on velvet dresses was an essential part of the embellishment carried out on robes used by the royalty, their families, and court, and the robe of honor was often worked in rich gold thread. Bokhara was the most important center for this work, and many workshops specialized in this. A range of techniques was prevalent and enriched the dress of the people of Central Asia. Their love of brilliant colors and bold patterns created a richness in the rather arid conditions of Central Asia. See also Resist Dyeing; Felt; Ikat. Abdullaev, T., et al. A Song in Metal: Folk Art of Uzbekistan. Tashkent, Uzbekistan: Gafura Guliama, 1986. Asian Costumes and Textiles from the Bosphorus to Fujiyama. Milan, Italy: Skira, 2001. Beresneva, L. The Decorative and Applied Art of the Turkmen. Leningrad, Russia: Aurora Art Pub., 1976. Block Printing in Uzbekistan: Past and Present. Tashkent, Uzbekistan: UNDP, 1979. Grube, Ernst J. Keshte: Central Asian Embroideries. New York: Marshall and Marilyn Wolf, 2003. Kirghyz Arcok es Himzesek. Neprajzi Museum, 1995. The Kirghyz Pattern. Kyrgyzstan, 1986. Morozova, A. S. Folk Art of Uzbekistan. Tashkent, Uzbekistan, 1979. Pope, A. V., and P. Ackerman. A Survey of Persian Art. New York: Oxford University Press, 1939. Undeland, Charles. The Central Asian Republics: Fragments of Empire, Magnets of Wealth. New York: The Asia Society, 1994. Vollmer, John E., E. J. Keal, and E. Nagai-Berthrong. Silk Roads, China Ships. Toronto: Royal Ontario Museum, 1983. Watt James, C. Y., and Anne E. Wardwell. When Silk Was Gold: Central Asian and Chinese Textiles. Abrahams, New York, 1997. Zhao Feng. 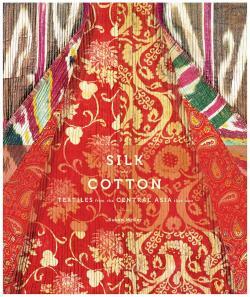 Treasures of Silk: An Illustrated History of Chinese Textiles. Hong Kong: ISAT/Costume Squad, 1999.